of olive oil, a lot of tastings are organized with other engaging and interesting activities. 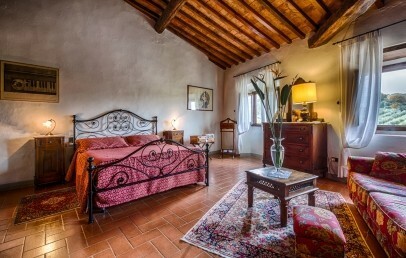 The Villa has also been refurbished with a classic and peculiar taste with very wide rooms. Recommended not only for couples of all ages but also for families with small children. In the middle of Mugello Valley, at about 6 Km from Vicchio and 35 Km from Florence, Villa Campestri Olive Oil Resort is surrounded by a green park with olive trees and centuries-old trees. Guests can simply relax walking in the park or be led by a botanical guide to discover the rich variety of the wild flora. The Renaissance Villa has been built around an ancient fortress dating back to XIII century and is surrounded ancient olive groves: the glory of the Villa is the production of high quality olive oil. The restoration made by the current owner Paolo Pasquali, who bought the Villa in 1989, is only the last of a long series of renovations, additions and embellishments started in the XIV century. Double Classic - about 30-35 sqm, have private bathroom with shower or bathtub. 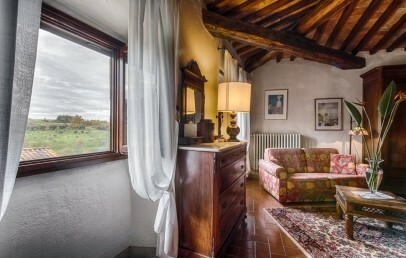 Double Superior - about 35-40 sqm, have private bathroom with shower or bathtub and view over the Mugello Valley. Junior Suite Romantic are the best choice for couple looking for an intimate stay. They dispose of a sitting area and have view over the park or the olive grove. Junior Suite Classic have double bed, a living area equipped with table and armchairs and view over the park or the olive grove. 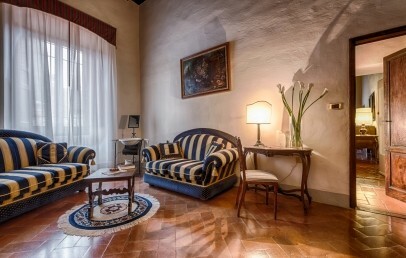 Junior Suite Superior dispose of a living area with table and armchairs and have view over the park, the courtyard or the cypress tree avenue. Prestige Suite has a separate living room with table and armchairs, bathroom with shower and view over the park, the olive grove or the cypress tree avenue. 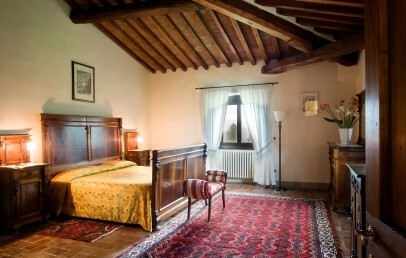 The Honeymoon Suite has a romantic four-poster bed dating back to XIII century. Triple rooms – the ideal solution for families with children of for groups of friends, they can accommodate up to 3 people (1 queen size bed + 1 singe bed or three single beds). They overlook the park or the Mugello Valley. Apartment Family Classic for 4 persons – 55 sqm, with double bed and two single beds, bathroom, fireplace and view on the park, on the olive grove and on the typical rural backyard. Not far from the Villa, the guests can participate in several sport activities: golf (15 Km far and a -15% discount on fee entrance for the guests of Villa Campestri), tennis (5 Km), water sports at Bilancino lake (20 Km), riding (9 Km), mountain bike guided tours or go to the International Mugello Circuit (18 Km). The restaurant of Villa Campestri is an authentic sensorial experience: not only for the possibility to taste excellent biological produces, in a setting where the Oil culture is king, but also for the exclusive location where all these delicacies are served. Wooden ceilings, terracotta floors and stone window frames are the fairy-tale scene for theme dinners, wine, cheese and oil tastings as well as for renaissance original dinners. The Villa disposes of a panoramic swimming pool, a wide garden, terrace overlooking the park, playground, entertainment games for kinds from 2 to 12 years, landing area for helicopters and other free services. Upon request and with fee, guests can take part in cooking lessons, SPO – salus per oleum – where Ayurveda massages with in-house olive oil are offered, olive oil tasting experiences, truffle hunting and much more. 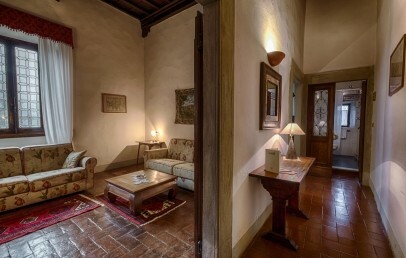 The guests of Villa Campestri Olive Oil Resort have free access to internet with Wi-Fi connection in all common areas. 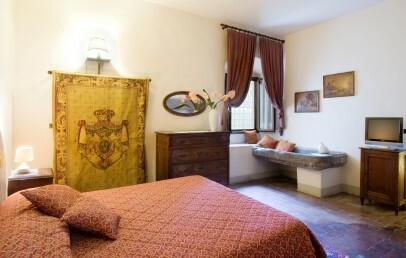 Comfortable bedrooms with antique furniture and warm soft colours. 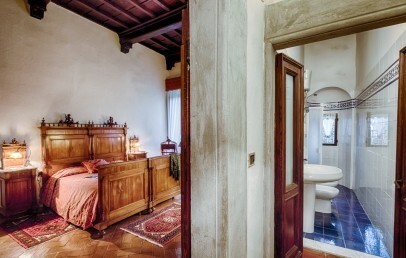 The private bathrooms have shower or bathtub and boast artistic ceramics from Borgo San Lorenzo manufacture factory. Some rooms are equipped for guests with disabilities. 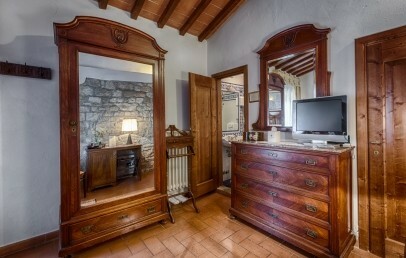 Bright and wide bedrooms with writing table, antique furniture and warm soft colours. 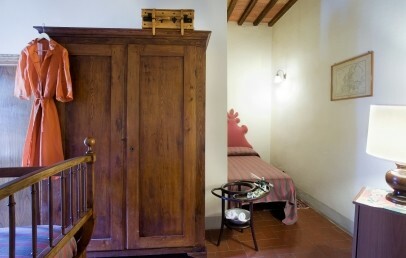 The private bathrooms have shower or bathtub and boast artistic ceramics from Borgo San Lorenzo manufacture factory. Some rooms are equipped for disabled guests. View over the Mugello Valley. 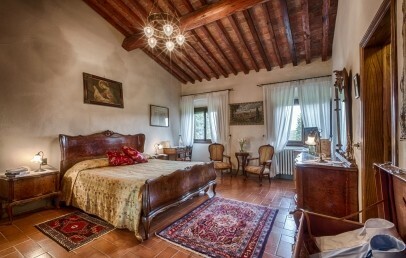 Comfortable bedrooms with antique furniture and a relaxing sitting area. 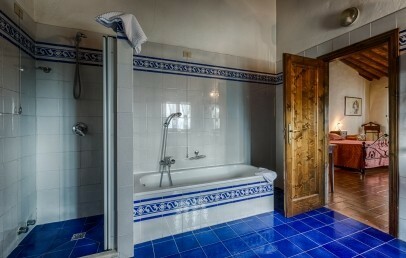 The private bathrooms have shower or bathtub and boast artistic ceramics from Borgo San Lorenzo manufacture factory. Some rooms are equipped for guests with disabilities. View over the park or the olive grove. 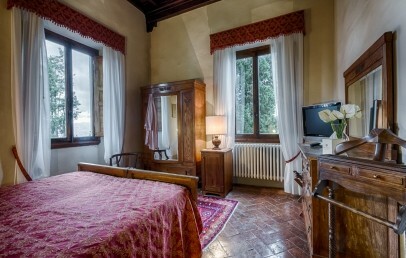 Comfortable bedrooms with antique furniture and a relaxing living area equipped with table and armchairs. 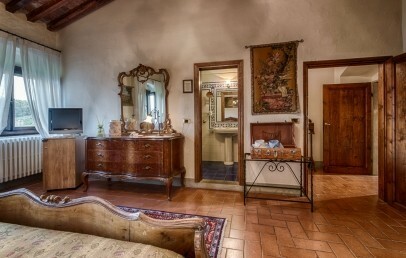 The private bathrooms have shower or bathtub and boast artistic ceramics from Borgo San Lorenzo manufacture factory. Some rooms are equipped for disabled guests. View over the park or the olive grove. 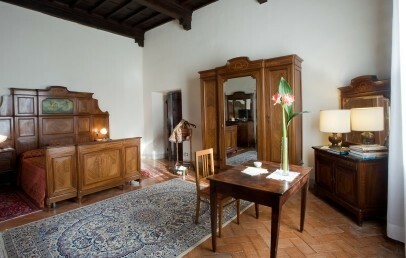 Comfortable Suites with living room, equipped with table and sofas and characterized by refined antique furniture. 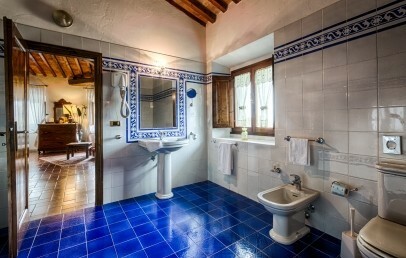 The private bathrooms have shower and boast artistic ceramics from Borgo San Lorenzo manufacture factory. Some rooms are equipped for guests with disabilities. View over the park, the olive grove or the cypress tree avenue. The original and comfortable Family Classic Apartments consist of a double bedroom, a bedroom with two single beds and a bathroom. 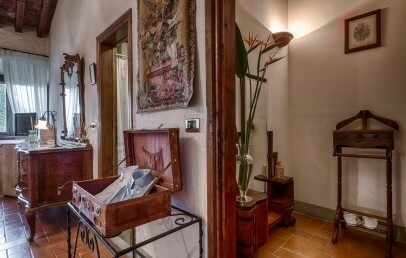 Decorated with handmade fabrics and antique furnishings that blends harmoniously with the oldest elements, such as the fireplace and the wardrobe from the 5th century as well a lovely view on the park, on the olive grove and on the typical rural backyard. 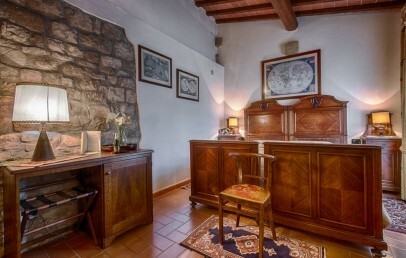 The bathroom (with bathtub or shower) is vested with the ancient ceramic production of "Chini di Borgo San Lorenzo".